It’s Saturday again! On the way to a sunny bootcamp class this morning, I popped into the local church ‘basement’ sale. 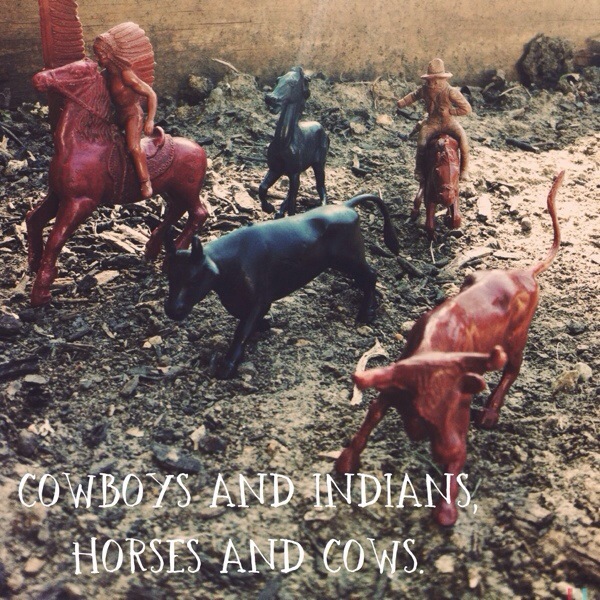 I picked up a ton of toy soldiers, cowboys, Indians and a gaggle of various animals. I love the guys who fit on the galloping horses! While I was wandering around the many many Christmas items, I spotted a box of sewing bits and bobs. It is full of needles, lots of needles, a few pins, some buttons and a good stock of vintage spools of thread. One is a gorgeous silver grey, thick thread on a big ole wooden spool. I will empty the box and share the contents with you next week. Have a happy sunny Autumn weekend and enjoy whatever you are doing. Tomorrow we have a Halloween block party so that will be a great time I am sure! Be sure to stop by on Monday for the weekly photo round up. Share your Six Word Saturday here or on Instagram #sixwordsaturday.